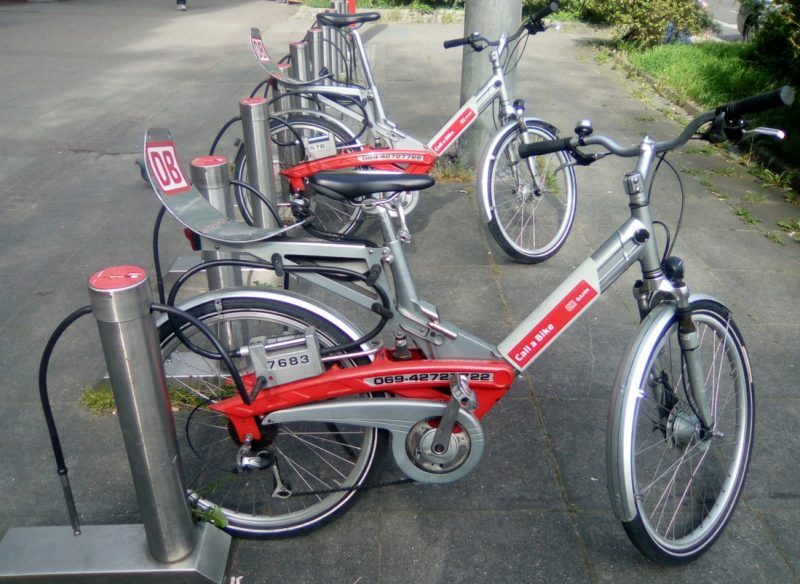 There is a system of bicycle rentals throughout Stuttgart. 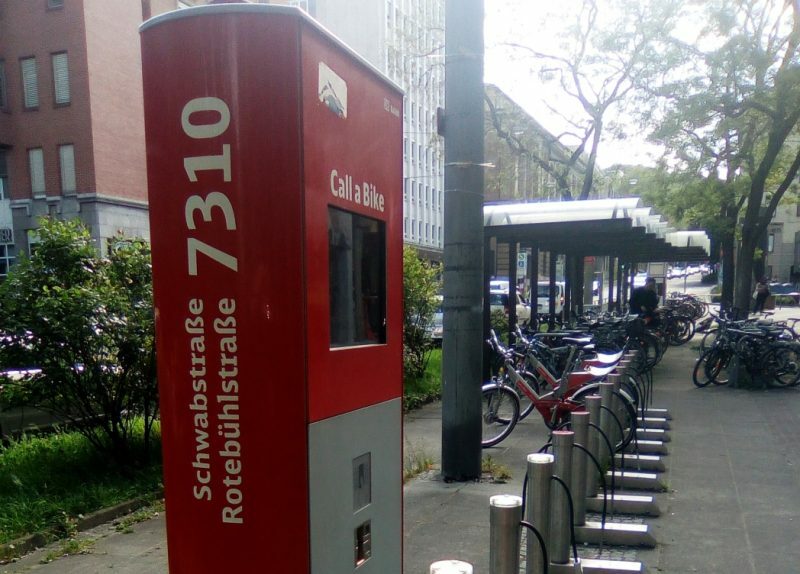 The majority of big to middle sized cities in German also offer the “Call a Bike” system. Operated by the Deutsche Bahn (or DB) they are self-service. Register first online. Then call on your mobile phone to unlock a bike that can later be left at any of the designated stations. The monthly membership fee offers the comfort or basic plans. Details shown below. Tourists without a local address can’t register as a member but can still use a credit card at the machine instead. The central machine has a display with maps showing the additional pickup locations. The price is based on time used. The tarrif structure has changed over the years so this is the latest data from September 2017 for most cities. The basic tariff is 3 Euros/year fee. 30 minutes cost 1 Euro or 15 Euros for 24 hours. Students, seniors over 65 and Bahncard holders get a special price of 12 Euros for 24 hours. One can rent 2 bikes at 1 time. The comfort-tariff is 9 Euros/month or 49 Euros/year. The first 30 minutes of usage is free each additional 30 minutes cost 1 Euro or 15 Euros for 24 hours. Students, seniors over 65 and Bahncard holders get a special price of 7 Euros/month or 99 Euros/year and a price of 9 Euros for 24 hours. One can rent 1 bike at a time but there is an additional discount for a partner membership 7 Euros/month or 29 Euros/year. The Call a Bike system is the only wide spread bike rental system available. So they don’t generally have much competition. The system in Stuttgart as well as Hamburg, Kassel, Lüneburg and Berlin have special exceptions to the above trariff structures. In Stuttgart for example, the first 30 minutes under the basic tariff is free! Since this is the main advantage of the comfort tariff in other cities, I see no reason one would choose it over the basic tariff in Stuttgart. For day rentals or longer, it is rather expensive so optimal for short rides. Best to give a bike back and take another one later if making a break to shop or do something else. They are ideal for city use but not meant for long tours. If it’s raining I’ll often take a U-Bahn into town and later return by Call a Bike if the weather is better. They are located at many locations in the city centers like the main train station, Rötebühlplatz, Schlossplatz etc. Some of the bigger suburbs also have locations but this is much more limited. The bikes are very sturdy but rather heavy. They all have lights and there are also electric models called Pedelecs or E-Bikes available in Stuttgart although they have yet to introduce them in other cities. They look nearly the same but cost € 0,12 per minute or 22,50 Euros (16,50 Euros for students, seniors & Bahncard holders) for 24 hours. They get locked into a charging station. The light on top of it indicates if it is charged or not. Otherwise, there is no visible difference! Best not to mix them up as the electric bike are more costly. This might be a rude surprise when you get the bill. It also seems possible that one of the normal bikes could be connected to the charging stations by mistake. Thus one could get a non-electric one by mistake. There is the occasional glitch in the system. Once in a while a bike won’t unlock as intended although the bike display shows it has. Other times it won’t properly register that it has been returned. A couple of times I have found an unlocked Call a Bike. Openly a case of someone not confirming its return on the bike display. The person is then going to pay for extra time or the cost of replacement if someone would just keep the bike! I’ve have to try multiple bikes to find one that unlocked properly or was not defective. Upon giving one back, I’ve had to try different docking stations until I found a working one. My tip is to jest keep trying different bikes until you find one that works. Also, ALWAYS reconfirm your bike display shows it has been given back.